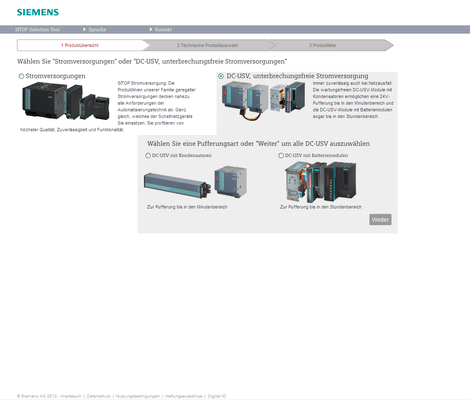 Home page of the Siemens Sitop Selection Tool for the quick selection and ordering of DC-UPS components. A choice of battery or capacitor can be made for the type of buffering. For further assistance in the selection, the performance features of several DC-UPS configurations can be compared. This comparison can be saved or printed out locally as a PDF file. Components that are copied into the product list can then be transferred directly to the shopping cart of the Siemens Industry Mall or exported as a PDF or Excel file. Detailed product information can be requested by means of the CAx Download Manager. Whereas the selection of components for an uninterruptible DC power supply was previously very time-consuming, the Sitop Selection Tool now makes this task possible with just a few mouse clicks. The latest product data sheets, manuals, certificates, and also 2D/3D data and circuit diagram macros ensure more efficient work at the engineering and design stage. A reliable power supply is essential for guaranteeing the productivity of automated plants and machines. Any power failure can cause a plant standstill and incur correspondingly high costs. Although modern 24 V power supply units offer the best possible security of supply, not even they are immune to prolonged power failures. For critical applications, therefore, an uninterruptible DC power supply (DC-UPS) is used in addition to the power supply unit - using either capacitor or battery technology. The range of use of the DC-UPS devices differs predominantly according to the type of energy storage. For example, absolutely maintenance-free capacitors are capable of buffering a 24 V supply for a matter of several minutes, while battery modules can even bridge gaps in supply lasting several hours. Which DC-UPS system is the right one depends on the requirements of the respective application. The designer or configuration engineer must consider some typical questions in this respect: What length of time is to be buffered, what load current must be buffered, what voltage is required by the load, and what communications interface is required? The decision is also made more difficult by the type of energy storage and by the different options for combining basic modules and a number of expansion components. Moreover, in the battery modules it is necessary to consider the discharge voltage dependent on the discharge current, according to the storage capacity or the type of battery used. In this case, only the data sheet from the battery manufacturer can offer further assistance. 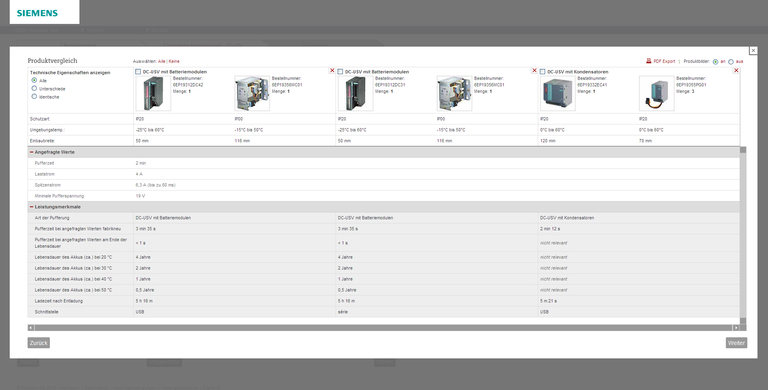 For the users of Sitop DC-UPS systems from Siemens, this once time-consuming selection of components can now be completed with a few mouse clicks. With the new version of the Sitop Selection Tool, uninterruptible power supplies using both capacitor and battery technology can now be selected and immediately ordered quickly and easily alongside the DC power supply unit. And for the selected components, a wide variety of product-specific information, such as the latest product data sheets, manuals, 2D/3D data and circuit diagram macros, are available for the efficient design and engineering of control cabinets. On the home page of the Sitop Selection Tool, users can decide whether they would like to begin by selecting DC power supply units or DC-UPS devices. If they opt for DC-UPS, they have the option of choosing between all DC-UPS units or a specific buffering type - battery or capacitor technology - and then continuing with the technical selection. The next page contains all the relevant selection parameters such as load current, buffer time, buffer voltage and peak current, which are essential entries for selecting the suitable DC-UPS configuration. These are marked as mandatory inputs. Once these parameters have been entered, the appropriate capacitor or battery systems are displayed, along with their performance features. To make the task easier, the tool dynamically adapts the possible input ranges of further parameters, depending on what has already been selected. Changes can be made here to the selection parameters at any time. The selection is also supported by texts that provide additional information about the required technical features and their relationships. If you are still not sure, you can compare several DC-UPS configurations on the basis of their performance features. Users also have the option of displaying all the properties, only those that differ, or only those features that are identical - and then selecting the product or required product configuration with a mouse click. In order to simplify the comparison, specific data that is not relevant to the selection can be hidden and then shown again. The product comparison can be saved or printed out locally as a PDF file. The relevant DC-UPS configuration can then be copied into the product list. It is also possible to select a number of different configurations. In the generated product list, performance data relating to the selected DC-UPS configurations can be displayed as well as the requested values. Furthermore, the required quantities are entered at this point and product configurations can be removed again if necessary. 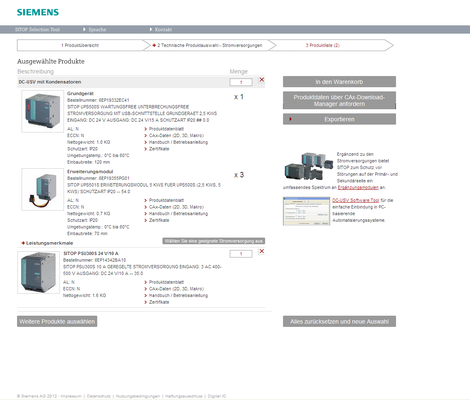 In the Siemens Industry Mall, registered users can put the product list directly into their shopping cart and place the order there. Alternatively, and without registering, there is an option of exporting the list - including the product images, performance data, and requirement parameters - to a PDF file or an XLS file for editing in Microsoft Excel. Both export files can be used for project documentation and also contain direct links to key product information such as data sheet or manual for each product. These links shorten the search considerably if further data is required afterwards, for example. · Product data sheets - users registered with the Siemens Industry Online Support can also have these sent to them in PDF format by e-mail. · Circuit diagram macros for Eplan Electric P8 in the new "edz" format. 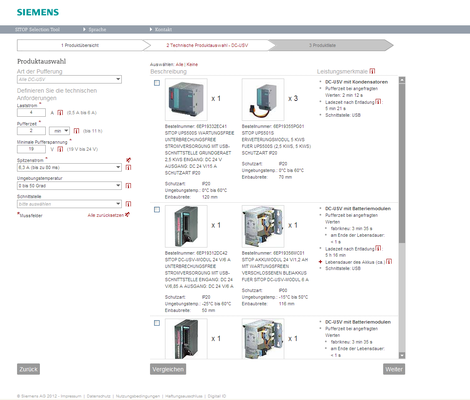 In addition to the actual "ema-macro", these also contain product master data, product image, data sheet, operating instructions, and links to the product pages of the Siemens Industry Online Support. This enables a Sitop product to be integrated very quickly into the article management of Eplan. · Certificates such as product approvals or declarations of conformity. If the designer or configuration engineer requires the product data listed above for all products in the product list, they can be requested with a single click using the "CAx Download Manager". In this way, users promptly receive all the product data they have requested in one zip file direct from the supplier. This data can then be imported as a packet or individually - as required - directly into the CAD and CAE systems such as AutoCAD or Eplan Electric P8. This simplifies the mechanical and electrical design and makes plant engineering significantly faster and more reliable. Having all product information at your fingertips saves the laborious task of preparing it, or at least finding it, and considerably reduces the amount of work in machine and plant documentation.